Fears that Donald Trump’s Inauguration may not have a marquee name attached vanished in a puff of smoke today when famed Austrian A Capella troupe The Von Trumps agreed to perform in honor of the 45th President. 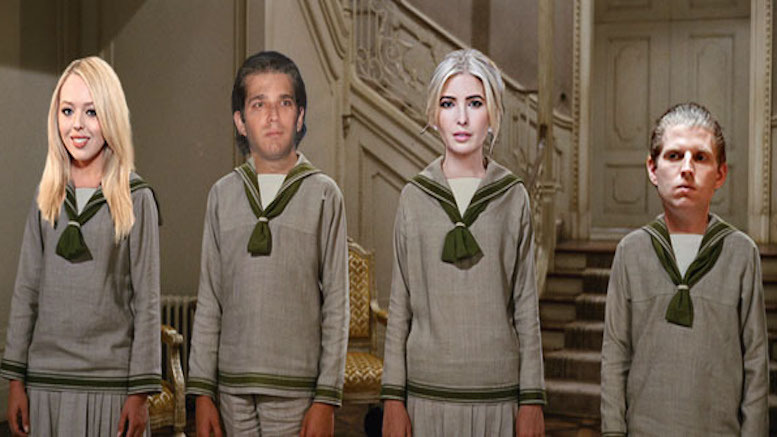 For those that have been living under a rock, the Von Trumps are legendary in Europe, having been the premier singing family in Austria, only to be ripped off by the second-rate Von Trapps, whose shameless dealings led to them being immortalized instead of the much deserving Von Trumps in the film ‘The Sound of Music’. The Von Trumps will be singing never-before-heard brand new songs specially composed for the event, leaving no time to perform familiar copyrighted classics like ‘Edelweiss’ and ‘Do-Re-Me’. When asked if the Von Trumps were any relation to him, Donald Trump said it was a total coincidence as there were lots of Trumps over there. Be the first to comment on "World Famous Austrian Acappella Troupe ‘The Von Trumps’ To Headline Inauguration"